Background: To determine the efficacy and safety of intravitreal Avastin (bevacizumab) in the treatment of choroidal neovascularisation (CNV) secondary to pathological myopia (PM). Methods: This paper reports on a consecutive prospective study of patients with CNV secondary to PM who were treated with intravitreal bevacizumab (1.25 mg/0.05 ml). Patients underwent complete ophthalmic evaluation, which included best-corrected visual acuity testing measured with Early Treatment Diabetic Retinopathy Study charts, optical coherence tomography (OCT), and fluorescein angiography. Results: There were 17 eyes of 17 patients, and the mean age was 55.4 (SD 10.0) years. At the 6-month follow-up, the mean visual acuity improved by 8.4 letters (p = 0.04). Forty-one per cent of patients increased at least one line, and 17% increased more than six lines. There were no cases of moderate vision loss (⩾3 lines) or severe vision loss (⩾6 lines). The mean OCT foveal thickness decreased by 79.6 μm (p = 0.002). Favourable outcomes were obtained in all subgroups. Patients received an average of one injection. As a complication, there was a tear of the retinal pigment epithelium. No other ocular or systemic side effects were observed. Conclusion: In our study, intravitreal bevacizumab appeared to be safe and efficacious in eyes with CNV secondary to PM. Nearly 10% of eyes with pathological myopia (PM) develop choroidal neovascularisation (CNV).1 This is a devastating complication that leads to immediate and potentially irreversible vision loss. In 2005, Nguyen et al4 published a paper reporting good results in two myopic patients with subfoveal CNV treated with intravenous bevacizumab (Avastin, Genentech, San Francisco, CA) as a rescue therapy. There were anatomical improvements in three eyes and visual acuity improvements in two of the three eyes. Recently, three papers and two case reports have been published regarding the use of intravitreal bevacizumab in CNV related to PM.5–9 All showed favourable results with no adverse events. Here, we present the results of a 6-month prospective study that includes eyes with CNV secondary to PM treated with intravitreal injections of bevacizumab. We conducted this study at Bellvitge University Hospital, a referral centre for macular diseases in Spain. The institutional review board of our hospital approved this study. As intravitreal use of bevacizumab is not approved in Spain, we obtained a compassionate-use indication from the Ministerio de Sanidad y Consumo (Ministry of Health and Consumer Affairs) before initiating the study. All participating patients signed an informed consent form. Each patient underwent distance best-corrected visual acuity (BCVA) measurements using an Early Treatment Diabetic Retinopathy Study (ETDRS) chart administered at a distance of 2 m by a certified examiner. An ophthalmic examination was performed, including slit-lamp biomicroscopy, intraocular pressure measurement, colour fundus photography, red-free fundus photography, digital fluorescein angiography (FA) (Imagenet, Topcon Corporation, Tokyo) and optical coherence tomography (OCT) scanning (Stratus OCT 3, Zeiss Jena GmbH, Jena, Germany). The following inclusion criteria were applied: (1) age 30 years or older, (2) PM defined as an eye with a minimum refractive error of –6 dioptres and an axial length ⩾26 mm and retinal signs such as lacquer cracks, (3) CNV under the geometric centre of the fovea (subfoveal), (4) visual acuity at baseline, Snellen equivalent of 20/40 to 20/500, (5) active CNV confirmed with FA and OCT, and (6) absence of other ocular diseases that could affect the BCVA. Patients could have received treatment for CNV with PDT before being recruited for the study. We did not include patients younger than 30 years, since we were evaluating an experimental treatment, and it is not known whether bevacizumab can cause fetal harm when administered to a pregnant woman or can affect reproduction capacity. Bevacizumab aliquots were prepared by our hospital pharmacy. Patients were treated with intravitreal injections of bevacizumab (1.25 mg/0.05 ml) in the office under sterile conditions. After topical anaesthesia, the ocular surface and the lids were disinfected with povidone iodine. We used a speculum, sterile gloves and a surgical drape. The injection was performed in the inferior temporal quadrant 3.5–4.0 mm posterior to the limbus with a 30-gauge needle. The injection site was compressed with a cotton swab to avoid reflux when removing the needle. After this, the ocular fundus was examined to rule out any complications and to check the perfusion of the central retinal artery at the optic disc (fig 1). Topical drops of ofloxacin were prescribed four times a day for the following 4 days. 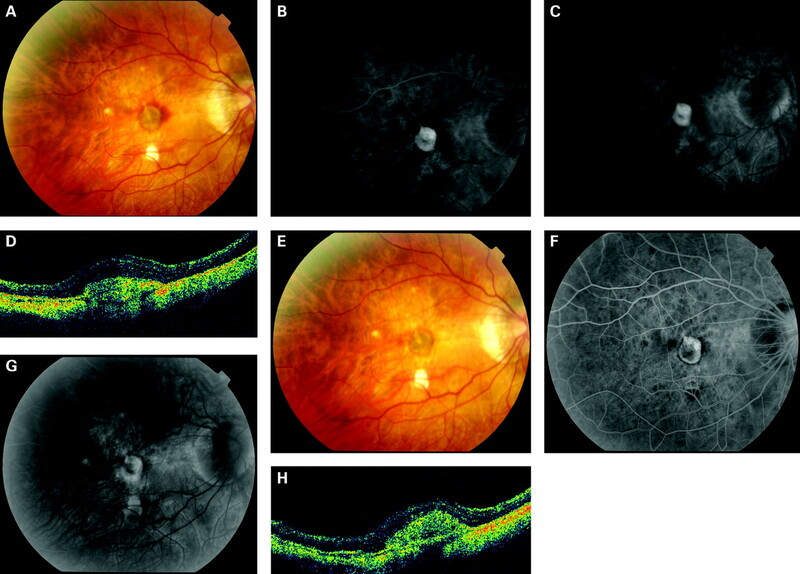 Figure 1 (A–D) Baseline fundus photographs and fluorescein angiography showing an active subfoveal choroidal neovascularisation with haemorrhaging and leakage. Optical coherence tomography shows macular thickening with intraretinal fluid (vertical scan). (E−H) Fundus photographs showing that at the 6-month follow-up, the haemorrhages have disappeared, and there is no evidence of fluorescein leakage. Optical coherence tomography shows resolution of the macular oedema (vertical scan). Follow-up examinations were carried out every 4–6 weeks. At each visit, another complete ophthalmic examination was performed, including BCVA testing with ETDRS charts and OCT scanning using radial lines and fast macular thickness protocols. The need for retreatment was based on the presence of recurrent intraretinal or subretinal fluid on OCT scans. Fluorescein angiography was also performed and used to decide the need for retreatment when OCT scans were not demonstrative. Main endpoints were mean change in BCVA and in foveal thickness. Data were analysed using the paired t test. A p value <0.05 was considered significant. Table 1 shows the patient’s characteristics. We included 17 eyes of 17 patients. Patients were enrolled between March 2006 and September 2006. Sixteen were females, and one was a male. The mean age was 55.4 (SD 10.0) years. Eleven patients were older than 50 years. We only included three women of childbearing age who were suffering from vision loss despite receiving PDT for their condition. The mean axial length was 28.4 (17) mm, and the mean number of dioptres was −12 (−4.8). There were nine right eyes and eight left eyes. Thirteen eyes were phakic, three eyes were pseudophakic, and one eye was aphakic. Nine eyes had been previously treated with PDT with verteporfin. Table 2 shows the mean change in visual acuity. At the 6-month follow-up, the mean visual acuity improved by 8.4 letters (p = 0.04). The visual acuity improvement was higher in the untreated eyes (9.6 letters; p = 0.13) than in the previously treated eyes with PDT (7.3 letters; p = 0.09). Patients with an age ⩽50 years improved by a mean of 8.7 letters (p = 0.13), and patients older than 50 years improved by a mean of 8.3 letters (p = 0.1). Overall, seven cases (41.1%) increased at least one line of visual acuity (table 3). Three eyes (17.6%) increased more than six lines of visual acuity. There were no cases of moderate vision loss (⩾3 lines) or severe vision loss (⩾6 lines). Table 2 also shows the mean change in OCT foveal thickness. Overall, a significant reduction in mean foveal thickness (79.6 µm) was observed at the 6-month follow-up (p = 0.002). This reduction was more important in untreated eyes (109.1 µm; p = 0.03) than in eyes previously treated with PDT (53.4 µm; p = 0.003). The mean reduction was very similar in patients ⩽50 years (70 µm; p = 0.03) and in patients older than 50 years (84.9 µm; p = 0.01). The mean number of injections was 1.1. Only two patients were retreated during the follow-up. One eye required two injections (patient no. 7), and another eye required three injections (patient no. 5). Both patients were older than 50 years. Patient no. 5 received two additional injections at the second and third month, since recurrent intraretinal fluid was observed on OCT scans. Patient no. 7 received one additional injection at 4 months due to the presence of recurrent intraretinal and subretinal fluid on OCT scans. In both cases, there was consensus among the investigators in the decision to retreat the patients. As a complication, there was a tear of the retinal pigment epithelium (RPE) in one case (patient no. 1) after the first injection. No other ocular or systemic adverse events were recorded. Yamamoto et al5 reported a retrospective case series of 11 eyes from nine patients injected with intravitreal Avastin (1.25 mg). After a mean follow-up of 153 days, there was a mean visual acuity improvement of 3.5 lines and a mean OCT foveal thickness reduction of 103 µm with no adverse events. Overall, 10 of the 11 eyes showed improvements in visual acuity, and four of the five eyes previously treated with PDT showed improvements as well. Eight eyes received just one injection. Sakaguchi et al6 reported a prospective case series of eight eyes from eight patients injected with intravitreal Avastin (1 mg). With a mean follow-up of 4.4 months, the mean visual acuity improved from 0.26 at baseline to 0.51 at the last visit, and the mean OCT foveal thickness decreased by 43 µm. Five eyes received just one injection, and no adverse events were reported. Hernández-Rojas et al9 have recently published the short-term results of a prospective study of 14 eyes injected with 2.5 mg of intravitreal bevacizumab. The mean visual acuity improved from 20/200 at baseline to 20/60 at the 3-month follow-up with significant reduction in the mean OCT foveal thickness. There were no adverse events. In addition, two case reports described similar positive results in myopic CNV treated with intravitreal Avastin.7 8 (table 4). The present study is the only one that evaluates subgroup analysis by age and prior PDT. In our study, both untreated eyes and eyes previously treated with PDT showed a visual acuity improvement and OCT foveal thickness reduction. However, the benefit was more important in untreated eyes. It is likely that the potential for visual recovery is higher in a naïve lesion with less damage to photoreceptors and RPE cells. The overall population showed significance, but no significance was shown in smaller subgroups. In these cases, significance was not detected, since the groups were too small. The need for repeat treatment was based on the presence of recurrent intraretinal or subretinal fluid in OCT scans. This OCT-guided regimen is currently the most recommended when treating CNV with an antiangiogenic therapy.12 The retreatment rate was very low, with only two patients requiring more injections, suggesting that frequent injections with Avastin may not be necessary in CNV related to myopia. However, this trend could change with a longer follow-up. No systemic adverse events were observed. On the other hand, myopic eyes are potentially more susceptible to developing retinal tears and detachment after an intravitreal injection. Although we did not have these complications in our patients, no conclusions about safety can be drawn from so few patients with such a short follow-up. Tears of the RPE have been described with intravitreal bevacizumab in wet AMD patients.13–15 We observed this complication in one case of our study. Tears of the RPE in myopic CNV occur rarely. Laud et al described one case similar to ours in their article.7 We do not know whether it was related to the drug itself or to the route of administration. The strength of this study is the prospective consecutive nature as well as the standardised best corrected visual acuity measurements using the ETDRS chart.
. Patchy atrophy and lacquer cracks predispose to the development of choroidal neovascularisation in pathological myopia. Br J Ophthalmol 2003;87:570–3. VIP Study Group. Photodynamic therapy of subfoveal choroidal neovascularization in pathologic myopia with verteporfin. 1-year results of a randomized clinical trial—VIP report no. 1. Ophthalmology 2001;108:841–52. VIP Study Group. Vereteporfin therapy of subfoveal choroidal neovascularization in pathologic myopia: 2-year results of a randomized clinical trial—VIP report no. 3. Ophthalmology 2003;110:667–73.
. Bevacizumab suppresses choroidal neovascularization caused by pathological myopia. Br J Ophthalmol 2005;89:1368–70.
. Intravitreal bevacizumab (Avastin) as treatment for subfoveal choroidal neovascularization secondary to pathological myopia. Br J Ophthalmol 2007;91:157–60.
. Intravitreal injection of bevacizumab for choroidal neovascularisation associated with pathological myopia. Br J Ophthalmol 2007;91:161–5.
. Treatment of choroidal neovascularization in pathologic myopia with intravitreal bevacizumab. Retina 2006;26:960–3.
. Intravitreal bevacizumab for treatment of choroidal neovascularization in pathologic myopia. Retina 2006;26:1093–4.
. Etiology of choroidal neovascularization in young patients. Ophthalmology 1996;103:1241–4.
. Long-term visual prognosis of choroidal neovascularization in high myopia: a comparison between age groups. Ophthalmology 2002;109:712–19.
. An optical coherence tomography-guided, variable dosing regimen with intravitreal ranibizumab (Lucentis) for neovascular age-related macular degeneration. Am J Ophthalmol 2007;143:566–83.
. Acute retinal pigment epithelial tear following intravitreal bevacizumab (Avastin) injection for occult choroidal neovascularization secondary to age-related macular degeneration. Br J Ophthalmol 2006;90:1207–8.
. Retinal pigment epithelial tear following intravitreal injection of bevacizumab (Avastin). Eur J Ophthalmol 2006;16:770–3.
. Retinal pigment epithelium tear after intravitreal bevacizumab for exudative age-related macular degeneration. Am J Ophthalmol 2006;142:1068–70.
. Intravitreal Avastin for choroidal neovascularisation in pathological myopia: the controversy continues. Br J Ophthalmol 2007;91:128–30. Ethics approval: The institutional review board of the hospital approved this study. Avastin in myopic choroidal neovascularisation: is age the limit?